Ships from and sold by designed50. The eighth edition has been updated and improved–featuring a new chapter on securitization and the credit crisis, and increased discussion on the way commodity prices are modeled and commodity derivatives valued. Sold by eden lodge creations and ships from Amazon Fulfillment. Hull, Joseph L. Rotman School of Management, University of Toronto. 1.0 out of 5 starsIndian version. Be aware. I couldn't care less about how Indian market works, really. It's annoying that when you are learning some basic concepts and suddenly a section about Indian markets interrupts your thoughts. Immediately returned. Dry subject, but a very thorough book that teaches you everything you need to know about Derivatives. This is a textbook so the material is very dry. Somewhat easy to read but can put you to sleep. Homework problems are good. I would not recommend it unless you need it for class. I started not knowing a "put" from a "call," but I needed to know a fair bit about how financial engineers (coming from a family of PEs, I'm still not used to that term) use math. This has been the introduction I wanted - not the advanced stuff, but enough to help me understand that material. Methodical pacing leads the reader gradually through the basics, from just what a derivative is on through the brief story of how futures markets work - in short, they abstract buying and selling into buying and selling the right to buy and sell. I tend towards the concrete, so many of these transactions seemed a bit airy to me. Oh, I can follow the reasoning well enough, but I just never saw where the satisfaction of the thing solid and completed comes in. As it turns out, it doesn't. Once you've really got that in the pit of your stomach, then Hull's presentation follows smoothly. He gradually derives models of increasing complexity. Diligent reader with a little calculus or a lot of trust will follow along easily. Later chapters draw on more advanced concepts in probabilistic modeling, but present the reader with only the aspects needed for the discussion at hand - a mercy, considering the size of the specialized vocabulary involved in the rest of the explanation. This book ends when the foundation has been built. More advanced needs must be met with other sources - not a problem with this text, just a matter of its chosen scope. I needed that foundation, however, so I recommend this book to anyone with reasonaable math skills and a need to know the material. 4.0 out of 5 starsA bible, that's limited in scope. 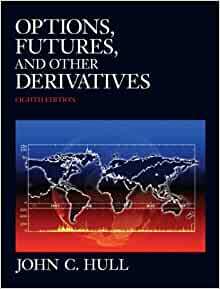 Although John Hull's book "Options, futures, and other derivatives" is considered by many to be the bible for understanding derivatives , I think this book took the same shortcut that many books on this topic have taken. That is, they've focused on options where the underlying asset are stocks, exclusively. I suppose Hull's reason was to simplify an already complex topic. Yet, as a recent graduate with a degree in economics, I was hoping to find more information on options with commodities future contracts as the underlying asset. The book is fairly easy to follow. the dialogue is interesting without being boring. However, if your interested in a beginning book about derivatives, look somewhere else. If your interested in a book about derivatives that offers strategies, some useful math, and bases most of the discussion around stocks, this book might just be for you. Very well written. Not a easy read if you do not know about options. But covers the concepts very well , and not just on surface,. The end of the chapters problems are pretty helpful too. One cannot fully understand the quantitative aspects of risk management without having this book in your reference library. It's thorough, easy to read and has all the necessary mathematics for reproduce the risk measures, pricing and valuation for most exchange traded securities out there. I fails only in the introduction to cover the requisite history of risk management but that's not so important for the work. I particuarly like the Merton model descriptions for pricing corporate bonds, the options pricing methods because it makes binomial pricing for options really easy to program yourself. This is one book you need in your library and also one you must read too. If you are into investing in options, you should buy this book. It is a hard book but is worth it. This book explain the concept, foundation, and details about options. It explains everything you need to know and learn about options. I used it as a reference.